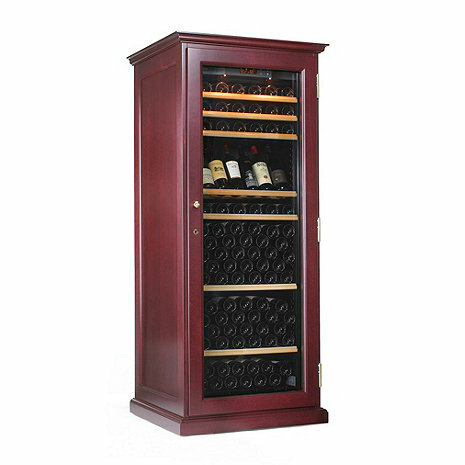 The only TRUE Wood Cabinet Wine Cellar in the Market Today. The EuroCave Performance 283 Elite wine cellar provides the same internal sophistication and qualities of the EuroCave Performance, but wrapped in solid beechwood. Available with either a 1-Temperature Zone or 3-Temperature Zone. The 1-temperature cabinet re-creates the natural deep cellar and ensures a constant optimum temperature between 55°F and 57°F. The hygrometer provides an LCD display to advise of humidity range. Built-in alarm alerts when humidity level has fallen below 50%. Water can be added to included lava rock cassette to increase humidity to optimum range of 50-80%. The 3-temperature cabinet has 3 distinct compartments; The room temperature compartment at the top keeps red wines at their recommended serving temperature (62-66°F), the aging compartment (53-57°F) for storing and aging your wine and the serving compartment (40-44°F) for chilling white wines and champagne for service. The 3-temperature unit does not contain a hygrometer or a lava rock cassette. Individually handcrafted in a thirty-step process, the EuroCave Performance 283 Elite will provide years of smooth, quiet, vibration-free service with the utmost ease of operation. Stored in these true wine cellars, your finest vintages will develop to their full potential. Also the security lock and key will keep your valuable collection protected. Capacity: Up to 223* bottles.